The Apostolate for Family Consecration’s beloved founder, my father, Jerome Francis Coniker (“Jerry”) passed into eternal life on July 4, 2018. At his death, he was surrounded by so much love and many prayers, and by many family members and loved ones who were with him in his daughter Maureen’s home. No doubt he is overjoyed to be reunited with my mother, Gwen, the love of his life, as well as his daughter Angelica, and his parents and brother. My father was a man truly driven to make a difference in the world. The salvation of souls and the protection of families through consecration were his passion. He desired the laity to know and embrace their call to holiness, to be saints, because he was convinced that ordinary fathers, mothers, and children can help to bring about the kingdom of God on earth when they make their daily family life an offering to God. This is the message of hope, inspired by the Fatima message, that he and my mother spread through the Apostolate for Family Consecration® and by the example of their life. At a time when there were not many lay ministries in the Church, my father overcame many obstacles and made many sacrifices, never wavering in his conviction that God had called him to this mission. Thousands of lives have been touched because he said yes to the Holy Spirit and chose to found the AFC with the help of my mother. I am filled with joy and gratitude that the fruits of his labors, as well as my mother’s, will live on in this ministry. Thank you for supporting this mission through your prayers and sacrifices. I invite you to join us in celebrating my dad’s legacy. Visitation will be from 4:00–9:00 p.m. on Wednesday, July 11, with a vigil service at 8:00 p.m. in St. John Vianney Chapel at Catholic Familyland®, and from 9:30–10:30 a.m. on Thursday, July 12 in St. Joseph Auditorium. A Mass of Christian Burial will take place at 11:00 a.m. on Thursday, July 12, in St. Joseph Auditorium. Following the Mass, he will be laid to rest in the crypt of St. John Vianney Chapel, next to my mother, Gwen. A lunch celebration will be held immediately after the burial. If you plan to attend the luncheon, please RSVP through this form. I ask your prayers for the repose of my dad’s soul, for my family, and for the AFC during this time. Thank you and may God bless you! The reception of the body and a vigil prayer service will take place at St. Gabriel Church, 3016 Providence Road in Charlotte, at 7 p.m. Monday, Jan. 1. 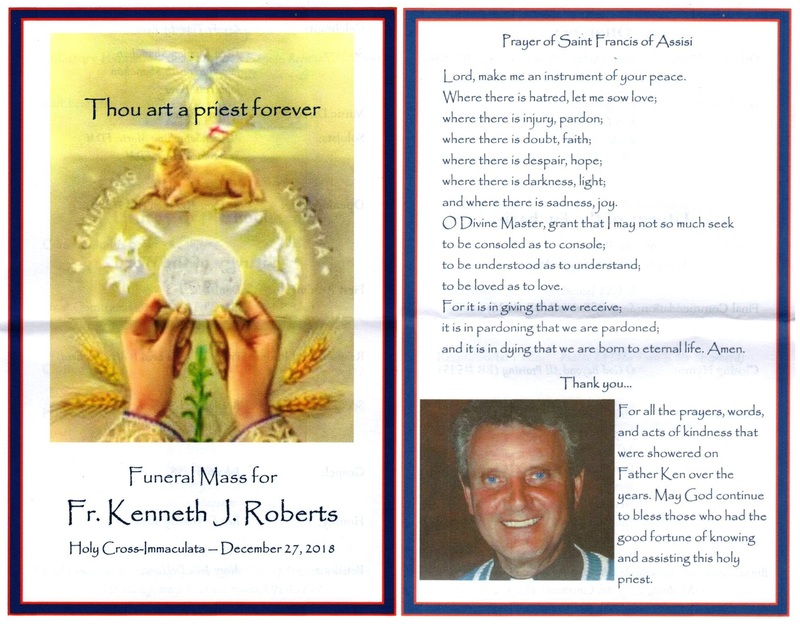 The Mass of Christian Burial will be celebrated at 11 a.m. Tuesday, Jan. 2, also at St. Gabriel Church. Following the funeral Mass, Bishop Curlin will be buried at Belmont Abbey in Belmont. Bishop, then Msgr. Curlin was our Vocations Director for Washington. He was the pastor of Old St. Mary’s in Chinatown. He accepted me into the seminary back in 1978. God bless him. 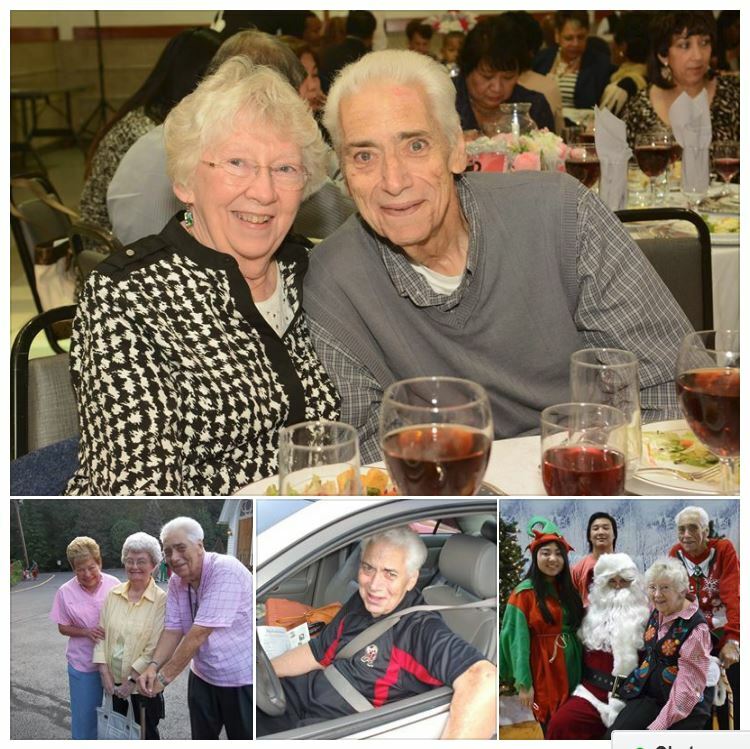 Dave Thomas, a parishioner of Holy Family Parish and a long-time Knight of Columbus, passed away today. Keep him and his family in prayer. Dave delighted in jokes and magic! Rest in Peace. On Sunday, July 9, 2017 of Glenn Dale, MD, formerly of Johnstown, PA. Beloved husband of Mary Jane Harbrant Thomas (married 54 years); loving father of Michael D. Thomas and his wife Susan McGuirk Thomas. Dear brother of the late Mary Jane Thomas. Devoted grandfather of Justin and Kendra Thomas. Also survived by many cousins four brothers-in-law, two sisters-in-law, and many dear friends. Family will receive friends at the family-owned BEALL FUNERAL HOME, 6512 NW Crain Hwy. (Rte. 3 South), Bowie, MD on Sunday, July 16, 2017 from 1 to 4 PM. A Memorial Mass will be held Monday, July 17, 2017, 11 AM at Holy Family Catholic Church, 12010 Woodmore Road, Mitchellville, MD. Interment private. He passed away at Hospice of the Chesapeake, surrounded by his loving family. He was born September 5, 1937 in Johnstown, PA, son of Kenneth and Rose (Coco) Thomas. Preceded in death by his loving parents and sister, Mary Jane Thomas. A member of Holy Family Catholic Church in Mitchellville, MD, Fourth Degree member of the Knights of Columbus Sacred Heart Council, and charter member of three Knights of Columbus councils in MD, and the Bowie Magic Club. Dave will be remembered as a caring, loving, faithful, and thoughtful son, husband, father, grandfather, and friend. He loved to entertain, do magic for children and at convalescent homes, and organize and MC local events. Interment at St. John the Baptist Cemetery, New Baltimore, PA will be scheduled at the convenience of the family. In lieu of flowers, memorial contributions may be made to For the Kids, Inc., a charity founded by Dave’s son, Mike, to benefit local children with serious medical issues. Donations may be sent to For the Kids, Inc., 1119 MD Route 3 North, #210, Gambrills, MD 21054. On Tuesday, October 7, 2014, of Silver Spring, MD. 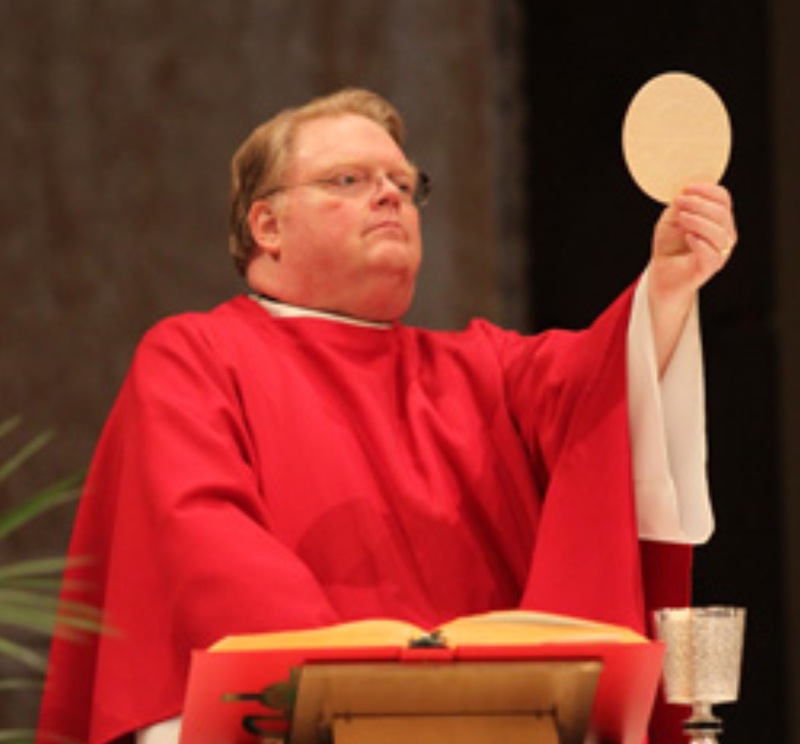 Priest of the Archdiocese of Washington. Beloved son of the late Joan Louise and John R. Pennington, Jr.; brother of Mary Fourcade, Mark Pennington (Sherrill), Judy Pennington and Janice Moulden (Ross); uncle of Kimberly, Kristie, Adam, Jason and Xander. Friends may call at St. John the Evangelist Church, 10103 Georgia Avenue, Silver Spring, MD 20902, Sunday from 3 to 7 p.m. with Vigil Mass at 7:30 p.m. Mass of Christian Burial at St. John the Evangelist Church on Monday, October 13 at 11 a.m. Interment All Souls Cemetery. Memorial contributions may be made to St. John the Evangelist Church at the above address.